With crazy balmy temps on the east coast, it feels more like sandal season than the holiday season! Which leads me to contemplate all the new spring sandals already hitting the virtual shelves. While it seems counter-intuitive to buy sandals now, it's actually wise because the best ones always sell out before spring officially arrives! Plus, they'll work swimmingly on the next warm weather getaway. 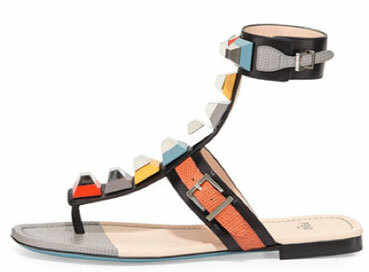 I'd like to take these by Fendi (above), Alexandre Birman, Splendid, Schutz, Sophia Webster, and Topshop.